Which Obesity Surgery? Why Sleeve Gastrectomy? WHAT ARE THE ADVANTAGES OF SLEEVE GASTRECTOMY? *The gastric transition tract is narrowed. Sensation of fullness is achieved with a few bite food. *The secretion of the appetite hormone(ghrelin) decreases. Appetite is suppressed. *Balanced nutrition is possible. Patients can eat everything, but only small portion. *Natural passage of foods in the gastrointestinal tract is preserved. *The rate of complication and side-effect is relatively low. *It ensures loss of majority of excessive weight in a period of one year. 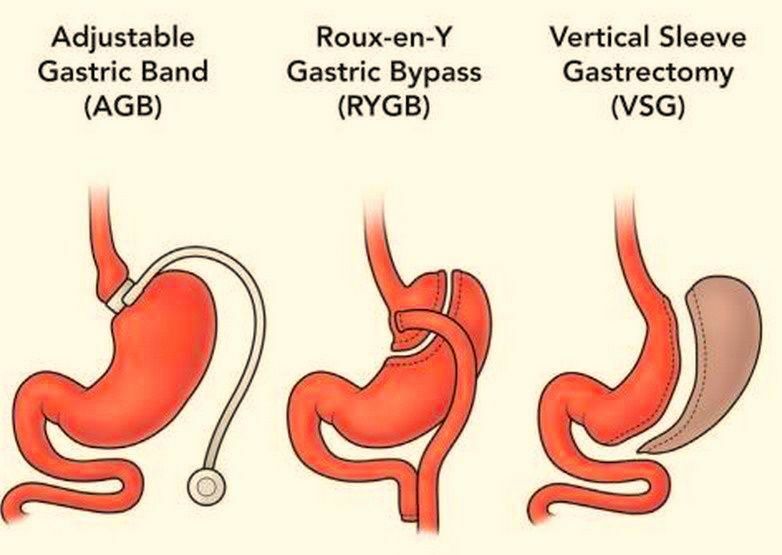 -Complications faced in gastric bypass surgery secondary to partial bypass of the small intestine are not observed in the sleeve gastrectomy. -Sleeve Gastrectomy is a simpler procedure and operation time is shorter than Gastric Bypass. -Hospital stay is shorter comparing to the Gastric Bypass. ♣Sleeve Gastrectomy is superior to the Gastric Plication regarding the effectiveness and the comfort. In gastric plication, residual gastric structure can be variable, while a standard form and volume can be created by the sleeve gastrectomy. ♣In gastric band surgery, which is another surgical procedure for obesity treatment, a silicone band has remained permanently in the abdominal region for many years. Sleeve gastrectomy surgery does not have such a problem. ♣Sleeve gastrectomy can be converted to some other obesity surgeries, if necessary. WHAT ARE THE DISADVANTAGES OF SLEEVE GASTRECTOMY? -A large part of the stomach is removed. It is not possible to convert the stomach to its natural form. - The potential of weight loss may decrease in patients who enjoy high-calorie liquid foods and sugary foods. -The stomach that is given a tube form may expand slightly over the time, and accordingly, the weight loss effect may decrease over the years. -This surgery requires more technological equipment comparing to the gastric plication. -It has become a commonly used surgery within the last decade. The ten-year results are very successful in a very large group of patients, while the long-term follow-up outcomes are not clear yet.